If you have a WordPress blog or website you probably spend time on the Posts screen viewing a listing of the latest posts. 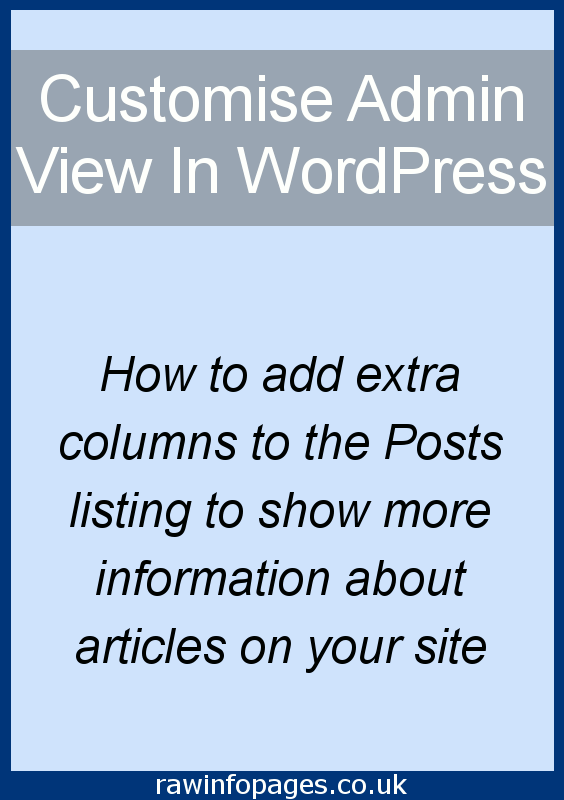 Create a better view of your site’s posts with more information. 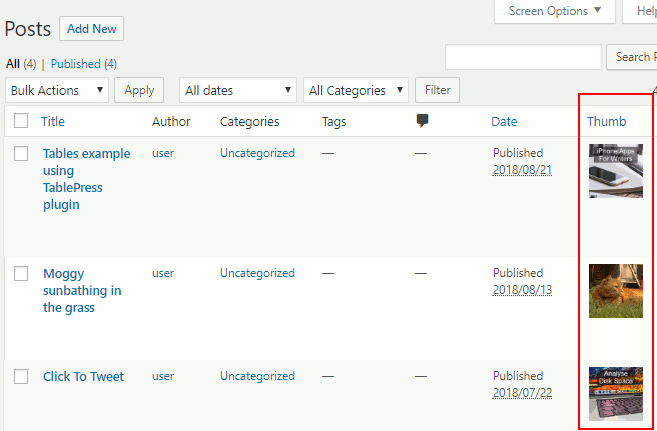 The Posts screen in WordPress is where you can see a list of posts, the titles, author, categories, tags, and created date. Click the Screen Options button at the top left and the columns that are displayed can be modified. Ones you don’t need can be hidden, but what if you want more? Is this possible? 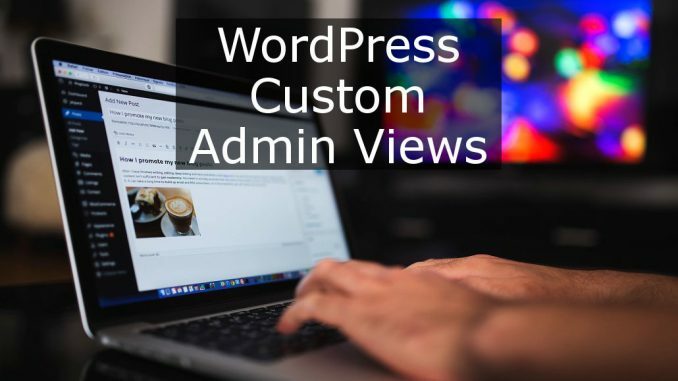 Yes, more columns and more information can be shown in the Post page listing by adding WordPress plugins that change the admin view. They have no effect on how visitors see the website, but they can make a big difference to you when working on the admin side. What else would you want to see on the posts screen? How about when a post was last modified? 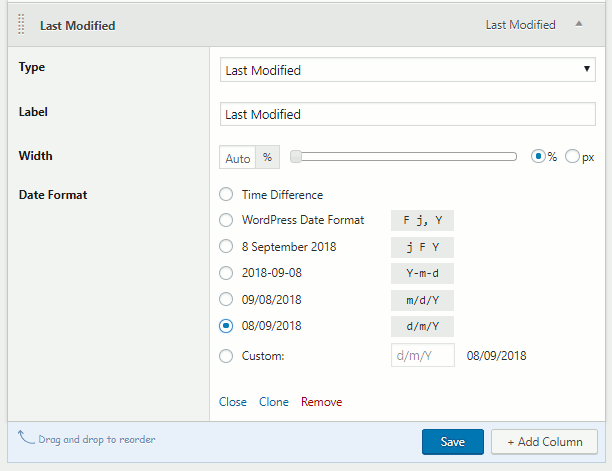 WordPress shows when a post was created, but not when it was last modified. It does store it, but doesn’t show it. If you could see that date, you would know which posts were the oldest and most in need of an update. You might want to list the number of words in posts so you can see if any are too short and are in need of lengthening. Longer posts generally attract more views and are liked by search engines. They are good for SEO. Read more on this in Get more visitors from Google with on-page SEO. You may also want to see the featured image used with each post, perhaps to check they are OK, but also to make sure that they actually have one. Featured images are used when sharing posts on social media and are very useful. If there was a column for them on the posts screen, you could easily see which posts did not have one, or see which were poor and could do with replacing. 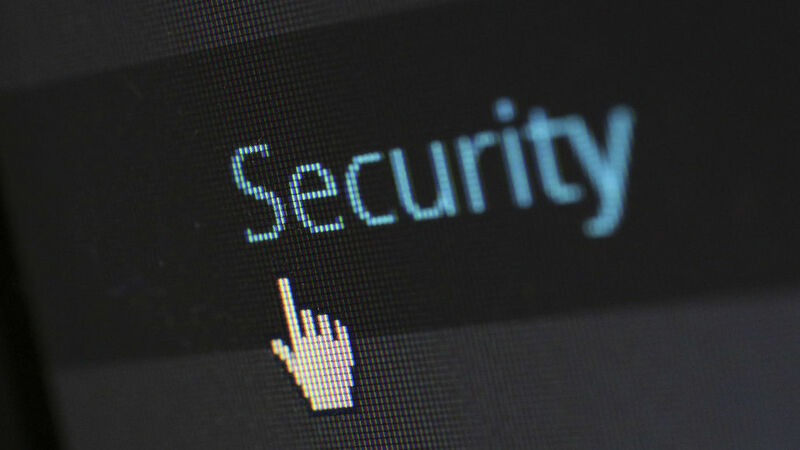 So how do we customise the posts screen in the WordPress admin interface? With plugins and there are several that you might want to try. Last Modified Timestamp is a plugin that does exactly what the name says. It adds an extra column to the posts listing that contains the date each post was last modified. That’s it and there are no settings and nothing to configure. It just works. Select Posts on the left and the last column after Date is Last Modified. Click it to sort posts by the date and click it again to reverse the sort. It is easy to see the oldest posts and you should update these to make them more relevant for readers and search engines. Update posts are good for SEO. Featured Image Admin Thumb adds a column to the WordPress Posts listing that shows thumbnail images of each post’s featured image. Install it in the same way as before – go to Plugins > Add New and search for the name. Install it and activate it. As with the previous plugin, there are no settings to configure and it just works. Thumbnail images can be clicked to view them in the media library or to change them. If there is no featured image for a post, click the link where the thumbnail should be and select one. This plugin works with the last one, so the last modified date and featured image thumbnails can be seen. We could continue adding plugins to add extra columns to the Posts page, but there is a better way and that is to install Admin Columns – one plugin to rule them all! This one is able to add over two dozen columns to the posts listing. The idea is not to add them all, which would lead to a very crowded posts listing, but to choose the ones you want. You could add three or four of your favourites for example. Go to Plugins > Add New and search for ‘admin columns‘. Click Install and then Activate. 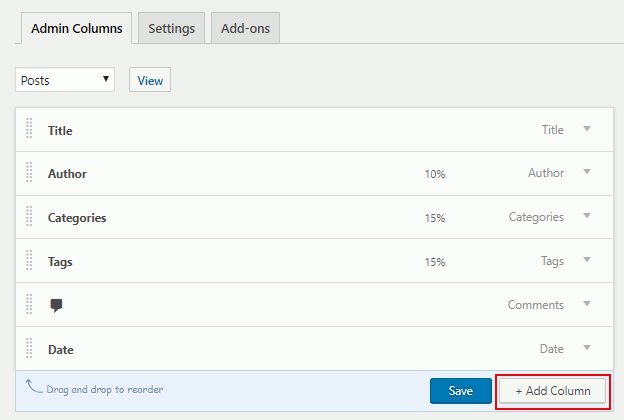 Go to Settings > Admin Columns to configure what appears on the WordPress Posts page. The order of items can be changed by dragging the little grid of dots on the left. Move items up or down the list. To add an extra column, click Add Column, obviously! Select the Type at the top – here I chose to add a Last Modified column. Label is the title of the column and it can be edited, but it could not be clearer. The Width of the column can be set, but it is best left on Auto so it auto-resizes with the browser width. Each type of column has different settings. The Last Modified column shows dates and so there is a choice of date formats. If an Attachments column was added, then there would be options to show thumbnails, and an Excerpt column has the option to set the number of words, and so on. Click Save to save the new column settings and add more columns if you want. 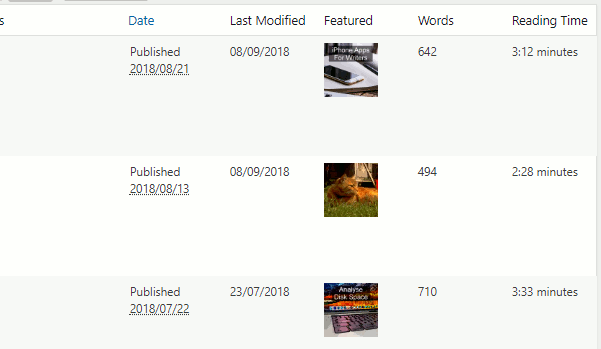 Here is an example and I added a Last Modified column showing the last date a post was updated, a Featured column shows thumbnails of the featured image, Words shows the number of words in the post, and Reading Time shows how long it will take the average person to read it. These are just a few of the many types of column that can be displayed with this plugin and it is excellent. A limitation of the free version is that the columns cannot be sorted, but there is a paid Pro upgrade that adds this and several more features if you need them. RAWinfopages is produced by Roland Waddilove - no company, no staff, no budget, just me! Rising costs and ad blockers are tough for independent sites, so please show your support and become a member. There are useful benefits too. Thanks!